Guitars365 provides a complete collection of top brand guitar equipment for both beginners and professionals all at competitive prices. Our online guitar superstore stocks top brands Fender, Gibson, Ibanez, Dean Vendatta and Epiphone you can rest assured that the guitar you buy from us is of the highest quality. We cater for types of guitarists electric, acoustic, and bass. With so many different ways of playing this amazing musical instrument from Spanish to Rock is important that you choose the right style of guitar for you, and our the right size using our online sizing chart. You can also read latest reviews on best guitars with an unbiased opinion ensuring you get the right guitar at the right price. Best Choice Products Beginners Acoustic Guitar complete with Case, Strap, Tuner and Pick in a bright pink color. This brand new 38″ Acoustic Guitar is the ultimate starter guitar. It comes with all necessary accessories, including cludes case, guitar pick, pitch pipe, shoulder straps, and an extra set of strings. It is ideal for beginners and is ready to play straight out of the box. This beginners guitar is made of an all wood construction, steel strings, and has a glossy, smooth finish. The body features a 19 fret fingerboard and an easy to use tuner. 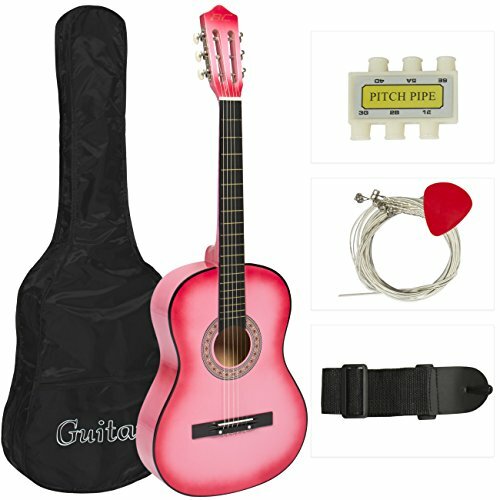 This starter guitar set includes a guitar pick, pitch pipe, shoulder straps, and an extra set of strings for replacement. Also included is a nylon carrying case.